Legendary singing cowboys Tex Ritter and Eddie Dean were stars of radio, film, records, TV and personal appearances and heroes to millions of fans from the Saturday matinee era of the 1930’s and 40’s on into the television era. Both men were born and raised in Texas and their careers were similar in many ways. Tex was born Woodward Maurice Ritter on January 12, 1905 in the little town of Murvaul, TX. Eddie Dean was born Edgar Dean Glosup on July 9, 1907 in the small town of Posey, TX. Both had musical careers on radio before coming to Hollywood in the mid-1930’s. Between 1935 and 1945, Tex starred or co-starred in 60 B-western feature films. Dean appeared in dozens of movies between 1934 and 1945, often as a member of the gang, one of the posse, or part of a group of cowboys singing around the campfire. Many of these roles were unbilled non-speaking parts. Finally in 1945, Eddie got his big break and starred in 18 singing cowboy westerns. The Happy Trails Children’s Foundation is proud to honor Tex Ritter and Eddie Dean this year with Silver Screen Legend XV. This is the 15th year the foundation, through the generosity of the renowned Colt’s Manufacturing Co. LLC of Hartford, CT, has used very special guns and holsters to raise money for abused children. 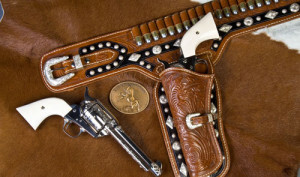 As a result of our association with Roy and Dale, and the positive and wholesome family values and American Tradition they represented, the Happy Trails Children’s Foundation is the only known children’s charity in the country today that actively supports shooting sports, Second Amendment Rights and responsible gun ownership, and is in turn supported by generous contributions from shooters, collectors, organized shooting sports and the firearms industry! We are proud of this unique partnership! 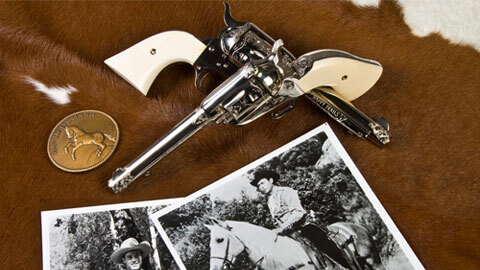 Order your tickets today for this beautiful and unique museum quality one-of-a-kind cowboy collectible. Tickets are $10 each or 11 tickets for $100. The drawing will be held Saturday evening, December 15, 2012. YOU DO NOT NEED TO BE PRESENT TO WIN! The winner will be notified by phone. You may check our web site for the winner’s name, after the drawing.